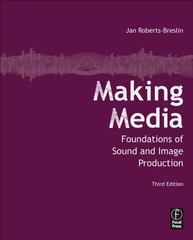 Making Media 3 Edition Making Media takes the media production process and deconstructs it into its most basic components. Students will learn the basic concepts of media production: frame, sound, light, time, motion, sequencing, etc., and be able to apply them to any medium they choose. They will also become well grounded in the digital work environment and the tools required to produce media in the digital age. The companion Web site provides interactive exercises for each chapter, allowing students to explore the process of media production. The text is heavily illustrated and complete with sidebar discussions of pertinent issues.